OR ALMOST TEN YEARS, I have belonged to a local group called the Association of Church Musicians in Philadelphia (ACMP). This group offers many wonderful things throughout the year: skills sessions, annual pastor/musician banquet, member directory, quarterly newsletter, networking opportunities, scholarships for high schools students involved with parish music programs, and an end-of-year Vespers and awards ceremony. The ACMP has been a terrific blessing to our archdiocese. The Association also offers an annual winter workshop, which I attended yesterday. Last year’s topic was “Celebrating Parish Funerals,” while this year’s focus was “Celebrating Parish Weddings.” The keynote speaker was Msgr. Richard Hilgartner, executive director of the USCCB Secretariat for Divine Worship. Among the many topics discussed were the present Rite of Marriage, the forthcoming second edition of the Order of Christian Matrimony, and best practices for providing music during nuptial Masses. One of the issues that received a lot of attention during the question & answer sessions was the Gloria. The rubrics of the third edition of the Roman Missal introduced a change that continues to confuse many parish musicians and priests. Because of the evident confusion among the workshop attendees, I thought it would be worthwhile to address the topic here. So, in summary, the Gloria is to be sung at every nuptial Mass, regardless of the season, but it is never used at a wedding ceremony outside of Mass. Additionally, the rubrics now make clear that the Act of Penitence is omitted. This creates what can seem a rather awkward progression: entrance chant, Sign of the Cross, greeting, Gloria, collect. It doesn’t seem to be the natural flow of our Catholic ritual. Msgr. Hilgartner explained, however, that the forthcoming second edition will include an introductory passage to be read after the greeting, which will ease the transition a bit. He read the draft of the introduction to us, and it impressed me as a beautiful and understandable précis on the theology of Holy Matrimony. 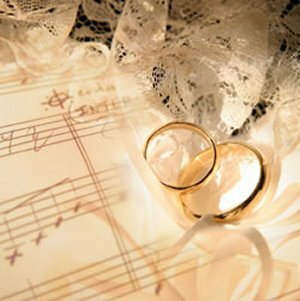 Incidentally, if you are responsible for providing wedding music regularly and you are looking for solid options, check out this complete package resource and these Responsorial Psalms.